National School Walkout and LEO on Alert: Coincidence? At 10:00 a.m. today — minutes from now — memorial walkouts for Columbine mass shooting victims will take place, part of a national school walkout protesting the lack of gun reform. Check Twitter for hashtag #NationalSchoolWalkout. 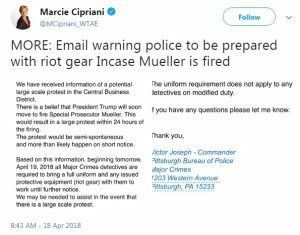 One problem: law enforcement may have received warnings this week about potentially violent protests — denoted by the call for riot gear — which could precipitate overreaction to what have been peaceful March For Our Lives events to date. 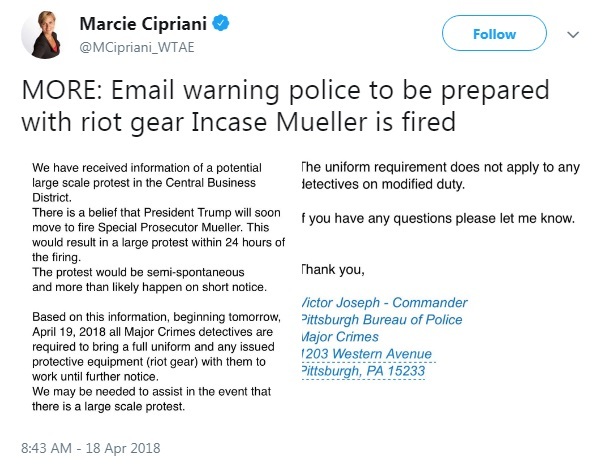 Pittsburgh LEO was cautioned about protests arising should Trump fire DOJ’s Rod Rosenstein or Special Counsel Robert Mueller this week. While the warning it shares expresses concerns about yesterday, will law enforcement continue to be on alert? We don’t know how widely the warning was shared or if there were multiple warnings from multiple sources. It’s also upsetting that the person who organized a tentative protest rally against the prospective firing of Rosenstein or Mueller had taken out a permit. Why is law enforcement getting its shirt in a knot about a rally with a valid permit? Why the warning this week coincident with the National School Walkout?